After an amazing recovery from Stevens-Johnson Syndrome, 10-year-old Parker Widmer, center, with her parents Lisa and Steve (standing behind her) visit with the Burn Institute staff as they drop off a donation to help other families in the unit. 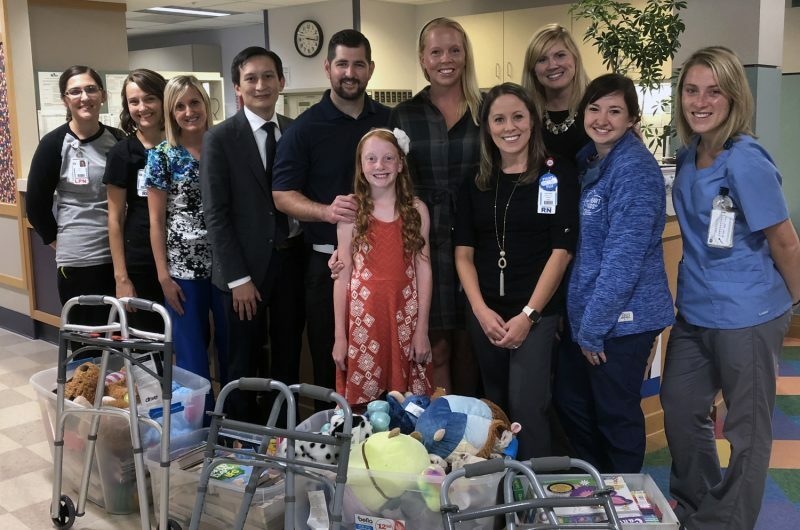 When Parker Widmer and her parents returned to Akron Children’s Hospital’s Paul and Carol David Foundation Burn Institute on Oct. 9, it was a happy reunion with Dr. Benjamin Lou and her nurses and therapists. In appreciation for her care in the center this past summer, the family brought a cash donation, stuffed animals, books and walkers for burn center patients just regaining their mobility. But the visit also came with a nice surprise for 10-year-old Parker. Just when she was talking to her caregivers about her favorite stuffed animal – a horse named “Willie Nelson” back home in her bedroom – the real pony named “Willie Nelson” who brought her so much joy during her 2-week hospitalization came ambling down the hallway to greet her. Parker, and her parents Lisa and Steve, of Orrville, never would have guessed they would spend 2 scary weeks in the burn center but that is place in the hospital with the expertise to care for Stevens-Johnson Syndrome, a rare and serious disorder of the skin and mucous membranes. It’s usually a reaction to a medication or an infection. Often, it begins with flu-like symptoms, followed by a painful red or purplish rash that spreads and blisters. Then the top layer of the affected skin dies, sheds and then heals. 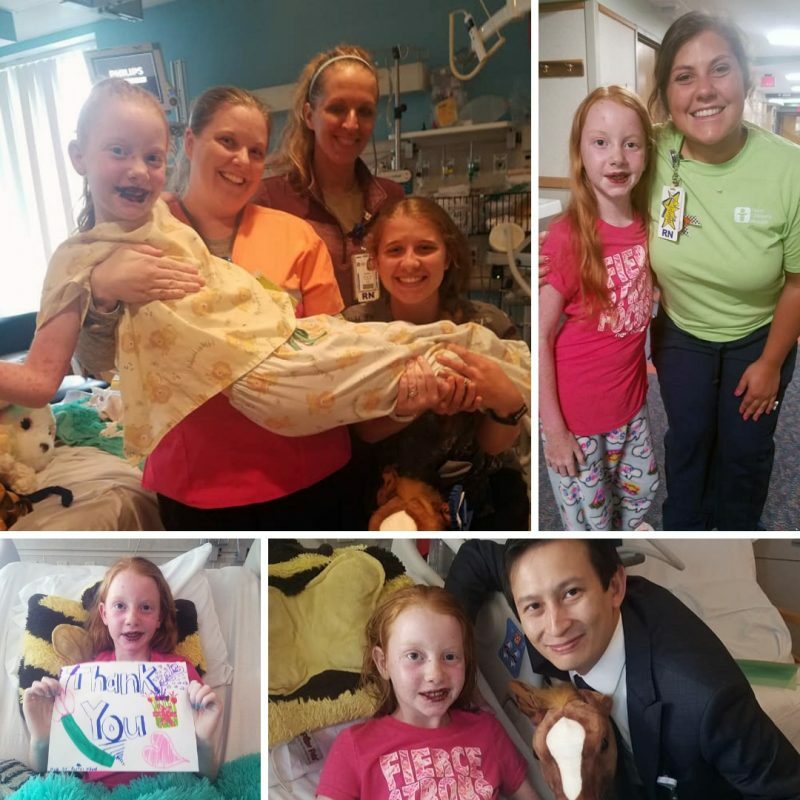 Parker’s father and grandfather are both physicians so the family knew to take these symptoms seriously, and Steve and Lisa wasted no time in bringing Parker to Akron Children’s Emergency Department on June 21. Parker’s case was likely triggered by a reaction to an antibiotic she had been taking for an ear infection. According to Dr. Lou, Stevens-Johnson Syndrome is treated with supportive care – IV nutrition, pain management, wound care, and bringing in a multi-disciplinary team that includes pediatric dermatology, ophthalmology, and physical and occupational therapy. Burn Institute staff was there to help Parker smile every step of her brave journey to health. Only after she began to recover did care providers admit to the Widmers how concerned they were about Parker. At her worst stage, her pretty face was nearly unrecognizably bloody and scabbed, and wounds in her mouth and throat made eating even soft food painful. “Once Parker’s new skin came back – so beautifully – we noticed she was still missing some of her signature freckles,” said Lisa. Parker, who has always loved horses, was having a rough day and was not eager to get out of bed and attempt her first steps when suddenly a special four-legged hospital “volunteer” entered her room. To say the least, she was quite surprised to see a horse, albeit a small one, enter her hospital room. Watch Willie Nelson help Parker with her physical therapy. Victory Gallop, a therapeutic riding program based in Bath Township, was still in the process of getting their new pony, Willie Nelson, comfortable with his patient visits to Akron Children’s around this time. 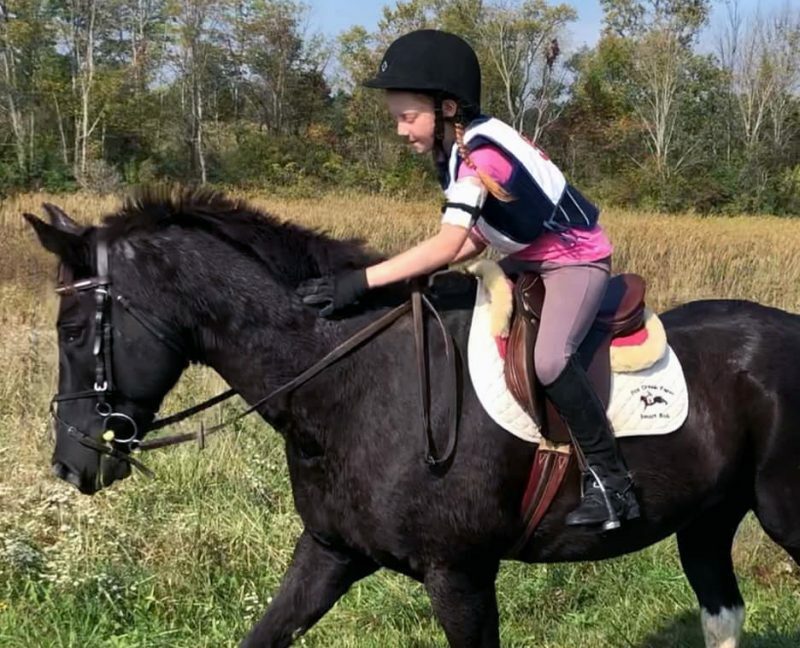 He had only recently replaced Petie the Pony, who had passed away in 2017 after spending 20 years as Victory Gallop’s equestrian ambassador to Akron Children’s. Since leaving the hospital on July 3, Parker has returned to her 4 siblings, her friends and 5th grade. Parker has begun to take riding lessons on her own horse, Tuxedo or “Tux.” She will be entering riding competitions in the near future.